Go easy on Detroit: fifty years of hard times have left a mark, and decennial attempts to rejuvenate the city have just prolonged the suffering. Nothing has worked. This Kiss song didn’t fix anything. Robocop never came to take out the trash. After the glory years of making all of the cars for America, Detroit’s wheels (figurative) fell off in a post-production lull from which it has never recovered. And now it’s almost as famous for being a ghost town as it ever was for industrial prowess/Motown/that Edward Furlong film. If you had to pick one (hyphenated) word to describe the cityscape, you might pick post-apocalyptic. God knows others have. Virtually every hipster and xyr photojournalism blog drop the phrase, and frankly it reeks of laziness. But it also reeks, in part, of the truth, so here we are. 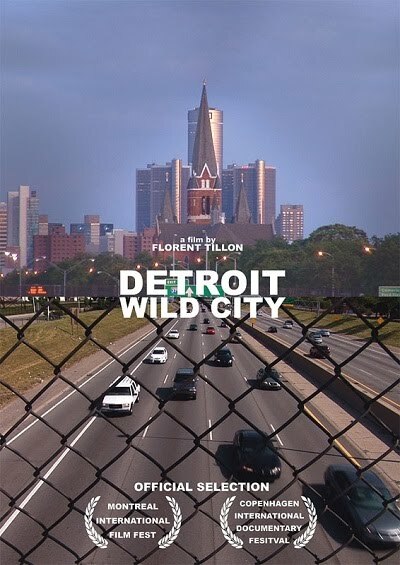 Detroit Wild City, a French documentary on the abandoned city and the few who still call it home, examines the abandoned buildings and weed strewn streets, and asks whether life ends when industry moves out. Director Florent Tillon attempts to steer the film away from perpetuating the post-apocalyptic cliché by showing the resilience of those left behind as they attempt to make the most of what is left for them. Overlong and a little meandering, Detroit Wild City is nevertheless a quietly engaging film, showing a city and its people fallen on hard times, but not dead yet. Side Note: Screened immediately before Detroit Wild City was the tiresome short The Future Will Not Be Capitalist, a stagnant ‘cinematic tour’ of some building inFrance. I am not sure why this film was screened. I am not even sure why it was made. Suffice it to say that it is a film only in the very loosest sense of the word (there were sounds; the occasional moving picture), and it had the unsettling effect of making me question whether I had entered the wrong theatre. Melancholia is the one film Lars Von Trier has made that he doesn’t like. ‘Too Hollywood’, apparently. I’m not sure if Von Trier has seen a Hollywood film or just had one described to him, but I suppose he sees this as a sequel of sorts to Michael Bay’s Armageddon. I doubt many others will feel the same way. The film beings as Earth careers into the planet Melancholia (this isn’t a spoiler: without that foreshadowing the film just wouldn’t work the way it does). As this overture ends we arrive, some time back, at the wedding reception of Justine (Kirstin Dunst), which begins as a humorously chaotic party and descends into sadness as the bride unravels in a manic episode. The second half shifts the focus to Justine’s sister, Clair (Charlotte Gainsberg), who attempts to care for the now thoroughly depressed Justine. As it becomes clear that Melancholia (which has emerged from behind the sun – subtle huh?) will destroy Earth, Claire succumbs to her own existential mania, and things generally begin to unravel. The falcon cannot hear the falconer. Things fall apart. Et cetera. Melancholia is surprisingly un-bombastic, both for the director and for a plot concerning the end of life in the universe. What begins as a high concept film with an ensemble cast ends with just three people, alone in a world that is both beautiful and highly unsettling. While I don’t buy into Von Trier’s dark ideology, this is a film that will likely stay with its audience, and is worth it for the imagery alone. Kirsten Dunst, Charlotte Gainsbourg, and Keither Sutherland reprising his role as Jack Bauer.